Boursin cheese with herbs elevates this baked macaroni and cheese casserole. This is a delicious take on the family-favorite macaroni and cheese. The Boursin cheese mixture adds extra flavor and wonderful creaminess. Grease a 2-to 2 1/2-quart baking dish. Cook the macaroni in boiling salted water, following package directions. Drain and rinse; then set aside. In a large saucepan, melt 2 tablespoons of butter over medium-low heat. Add the flour and stir until well blended and bubbly. Cook while stirring for two minutes. Add salt and pepper, and then gradually add the milk. Cook while stirring until thickened. Add the herbs, Boursin cheese, and cheddar and Parmesan cheeses. Cook, stirring until cheeses have melted. Stir in the drained macaroni. Spoon into the prepared baking dish. 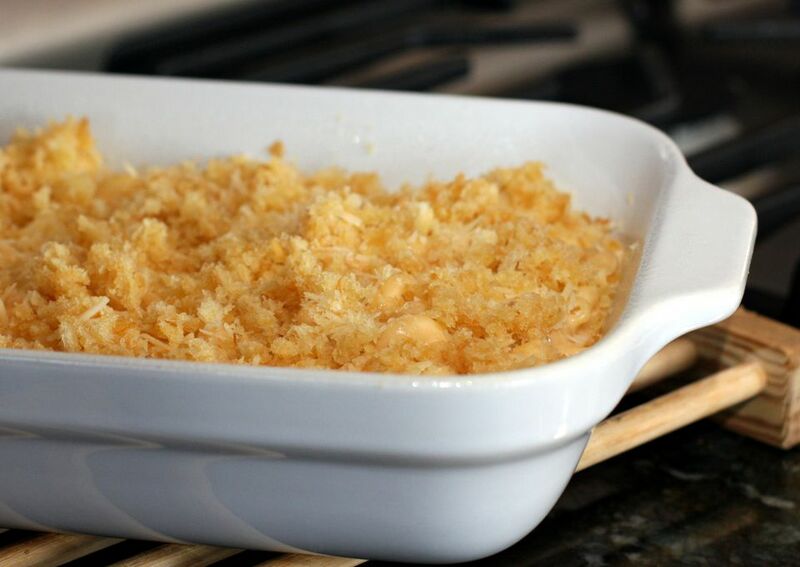 In a cup, toss the breadcrumbs with the melted butter and then sprinkle over the casserole. Bake in the preheated oven for 25 to 30 minutes, until macaroni and cheese are bubbly and topping is lightly browned.